Happy New Year dear followers. Fortunately we hadn’t made any NYE plan when the flu struck Chris a few days after Christmas and then moved on to me a few days later. Another fortunate thing is, that none of us has been really really bad, but just under the weather and not feeling to well. Flu, cold or what ever struck us wasn’t gonna keep us from having a good dinner and we therefore decided to bake some easy rustic baguettes and make these delicious and very easy pickled shrimps. It is easy to make and it tastes wonderful and can be served as a snack table or as an appetizer. The reason I call it Donna’s pickled shrimps is simply because I got the recipe from Donna who is very good family friend who have helped us a lot since we moved her. They usually make pickled shrimps around Christmas, but I can definitely tell you that this recipe will be used quite often in our house 🙂 So thank you Donna! Cook and peel the shrimps. I usually peel the shrimps first and then cook them, but some people find it easier to the other way around. If you want it to be even easier, you can just the cooked and peeled ones in your local supermarket. I always buy the raw shrimps and cook them for 3-4 minutes in simmering water. Let cool completely. Add salad oil, vinegar, salt, celery seeds and hot sauce in a large bowl and whisk to combine. 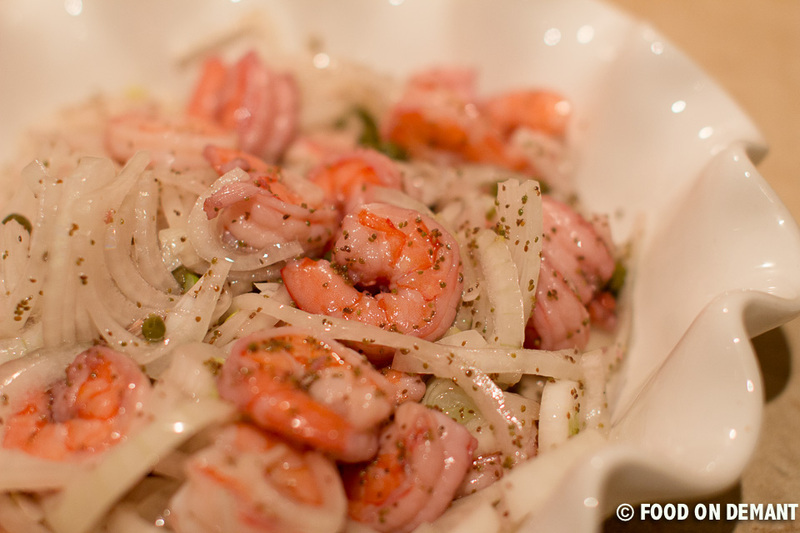 Slice the onion into whole or half rings and add to the oil mixture together with capers and cooled shrimps. Mix well, cover the bowl with plastic wrap and let rest in the fridge for 24 hours. Drain the pickled shrimps just before serving. Serve with freshly baked baguette and a good cooled white wine. I’m happy to have discovered your recipe for pickled shrimp. I had a friend that used to make them every Christmas eve but I never had the recipe. What a delicious recipe, I dared to do it to my girlfriend and was delighted.